Every bowling center encounters Murphys’ Law. This means the worst possible breakdown will occur at the most inconvenient time. And to make the situation worse, you won't have the critical part needed in the back room. These are the scenarios that test even the most seasoned mechanic. A necessary part is not on hand, or a time-consuming crisis breakdown delays or postpones a league. Lacking the needed part, most technicians will call a nearby center and ask to borrow it. But not all centers are on friendly terms. Distributors, if they have the item, may need several days to deliver it. In the case of a simple to remove part, it can be transferred from an unused machine, but of course, this still leaves a machine unusable. In some situations, the broken part can be taken to a local shop and repaired or duplicated. This can be very costly, but it could be less than the lost revenue from a broken down machine. Many times, imagination will outshine the above mentioned solutions. Pinsetter technicians can and do rebuild, redesign, and reconfigure parts when the need arises. Some of these ideas are out of crisis and others come from nuisance problems. No materials are out of consideration when trying to construct a required part in an emergency situation. Scrap iron, lumber and various types of rubberized parts find their way into the machines. Some work quite well, often performing as well as or better than the original manufactures’ parts. I have seen pool cues, garden hoses, shop rags and hose clamps used on pinsetters to get a machine through a league session. I am certain there are even stranger things that have been employed in an emergency. Nearly all mechanics will remove these "emergency engineered" items when the correct part arrives. They'll keep their new found repair item on the shelf, awaiting the possibility of another need for it. While many great ideas are born from springs and duct tape when haste was a priority, these "quick fixes" should be removed as the correct parts arrive. Scores of these emergency repairs fail miserably. Others are extremely simple, leaving one wondering why the machine was originally designed in such a complex manner. Of course, most capital equipment suppliers do not recommend modifying their machines. Doing so can void warranties and in some cases circumvent safety features. The safety features of your machines are there for your best interests and should not be tampered with. Some purists might say that the need for a quick fix is unfounded. If the mechanic is doing his job correctly, breakdowns will never occur. While this is a somewhat true statement, as with most things in life, there are always going to be unseen circumstances. Imagination is not just limited to parts. Many times a tool that is pinsetter specific is unavailable or just has not yet been invented. Hands on experience with the machine will give insight to allow a fertile mind to explore the possibilities of tool design. A majority of mechanics will agree that there are times when a third and fourth hand would be of great assistance. Science has yet to genetically alter us to that specification. However, many mechanics have constructed tools to allow them to perform duties that once required another person. There are numerous mechanic designed tools on the market. Most are constructed to save time, money and knuckles. Several allow for safe removal and replacement of items that can be very dangerous if not done with the correct tool. Several of the pin and ball cleaning cloths being used today were once a bowling towel that was held to a piece of frame work with a clothespin. Most have been refined into the current configurations we see in the supply catalogs. Yet the humble bowling towel is still the material of choice for many mechanics in the effort to keep balls and pins clean during an unusual situation. Most manufacturers have a very open mind to the ideas that are born on the "battlefield." A lot of mechanics have received monetary compensation for ideas that have been turned into sellable products. The imagination of the maintenance staff can reach mind boggling heights, designing everything from the above mentioned parts and tools to building electrical devices to replace often outdated and or obsolete parts. It's easy to be prepared for the "expected" things. It's the things that come out of the blue that will test your patience. Use your imagination to find a solution. With a little quick thinking and imagination, you can be up and running again. I guess Mr. Murphy never ran into a bowling mechanic with a roll of duct tape and some electrical wire ties. Have you ever wondered about the process of creating a new conditioner? How do we test? What do we look for when we’re testing? How do we choose test centers? How does field testing work? If you’ve ever wondered about the research and development process, or if you’ve ever thought you might like to be a test center for a new product, keep reading. Creating a new conditioner is a lot like baking a cake without a recipe; you know how you want the cake to look and taste and you know you’ll need some flour and sugar. But, you don’t have an actual recipe so you have to figure out the rest of the necessary ingredients in order to get to the desired result. Creating a lane conditioner can follow that same concept. In general, mineral oil is the “base” so we’ll likely use some combination of mineral oils to start. After that, we experiment with different combinations of chemicals to try to achieve the results we want to see. Since we’ve been in the lane conditioner business for quite some time, we have a solid foundation of knowledge of many raw materials. We know that some materials will give us more “slickness” while other materials may help the conditioner be “hookier”. We constantly search for new technologies to help us create the best lane conditioner we can. Once we have a formula, we start testing. For lane testing, we generally use a house pattern and we’ll use the same house pattern throughout testing so that we have an equal comparison when we make formula adjustments. We are fortunate to not only have our Batch Test bowlers, but some extremely talented bowlers throughout our building. So, we take full advantage and use them when we’re testing a new product. We try to use a variety of bowlers so that we can see how the conditioner performs for bowlers of different styles. And, as much as possible, we try to use the same set of bowlers throughout a product test. While they’re bowling, we’ll track scoring, bowler moves, and we’ll make notes on things like ball reaction, residue on the bowling balls, and carry down. In the lab, we’ll test physical properties like viscosity, density, and surface tension. These properties give us some general characteristics about the conditioner like how it might flow on a lane. We also do temperature stability testing. We’ll put samples through freeze/thaw cycles to see if the conditioner is impacted by cold and we’ll do heat ramp studies to see if the heat negatively impacts the conditioner. We even do chemical compatibility studies. Belts and other materials from pinsetters, tubing and other parts from lane machines, and other materials that could contact the conditioner are cut into pieces and soaked in the conditioner as well as in some of the raw materials. We measure the parts before we soak them and then measure them again after one month. This helps us determine if the chemicals will create any issues with the parts. The next phase of testing for a conditioner is field testing. Initially, we’ll test in one or two centers to make sure the product will perform well. We work with the centers to understand what they see from the conditioner using their normal pattern and maintenance routines. They provide feedback and we work together with them to make pattern adjustments, machine adjustments, and such to try to improve the performance. We track all of these changes and use the information to determine if we need to make adjustments to the product. If we make adjustments, we continue testing until we get to the point where we feel confident that we’ve created a viable product. Next, we continue adding centers to our field test. Ultimately, we like to have at least 15 centers test a product for several months. We try to cover as many different variables as possible by using centers all over the country. By testing on different lane surfaces, pinsetters, ball returns, and so forth, we can determine if the conditioner will be a good fit for different combinations and in different environments. While the product is in field testing, we continue collecting data in lab testing. We send samples to partner labs for analytical testing like flash point and fire point testing. These tests allow us to determine proper packaging and shipping requirements. We also submit a sample to USBC for approval. In order to gain USBC approval, a lane conditioner must meet the required specifications for viscosity and UV content. As we continue with field testing, we keep notes on pattern adjustments made by each center. This helps us learn what works; and, more importantly, what doesn’t; with patterns on different surfaces. We use this information once a product is released to the market so that we can give our customers educated adjustments for their patterns when they switch. What that means is you can switch with a little less trial and error and a few less irate bowlers. Just before we release a product to market, we build all of our marketing and sales materials. We use information we gathered from our field testers and data we collected during our various phases of testing. We conduct in-house training for our Techs, Customer Service, and Sales staff. And, we start making batches in preparation for sample kits. Our goal is to release the conditioner to the market in the summer so that your center has time to try it and fine tune your pattern before your fall leagues start again. Now, all this may sound glamorous, but many of our test centers would likely tell you that testing isn’t always rainbows and butterflies. It can get ugly and you certainly have to be willing to make your bowlers angry. When we send a center a new product, we request that the center try the product without making any changes to their normal procedures and pattern. So, if a center had been using a conditioner that was characteristically hookier, and we asked them to use a conditioner that is slicker, the bowlers would see something different than what they’re used to seeing. And, if scores go down, it could make for some pretty angry customers. Test centers can’t be reactive to that though. We need centers who can give us quality feedback and that are willing to make the adjustments we suggest based on their feedback. We need centers that will work with us as we work through issues and try to improve the situation. It can take some time to fine tune the adjustments and we need centers that are not going to throw in the towel while we work through the chaos. The rainbows and butterflies come when we get the right adjustments and scores go up and bowlers comment about not moving as much during a league session. Being a test center can be as frustrating as it can be rewarding. We do our best to create products that solve a problem or fill a need in the industry. The process takes a lot of time and it involves a lot of people. If we didn’t have customers to give us valuable feedback and we didn’t have test centers we could trust to help us during the development process, we wouldn’t be able to create solid products. We count on our customers to tell us what they think and even what they need as we continue to create products to improve the bowling experience. If you’ve made it this far and still think being a Kegel test center sounds pretty darn awesome, you can reach out to our Kegel team to see if you qualify. You can also fill out our Test Center Information Form so we can gather all of your center specifics. In fact, the uptake rate and quality of understanding increase dramatically when combining all three perception channels. Research has shown that when using just auditory or visual channels separately, only 10% of new information is absorbed. The combination of audio and video helps to increase the uptake level to 50%. Adding the kinesthetic channel to the other two provides an optimal rate of 90% of new information being understood. Thus, the integrated approach of using all three learning modalities is the most efficient. Of course, the coach needs to recognize and take advantage of the athlete’s dominant channel of perception. During the initial stage of skill training, it is necessary to create a complete field of information for a given skill set. During the later stages of skill encoding, the most efficient implementation is to work with the channel of perception which “delivers” information in the form closest to the type and kind of thinking directly involved in the learning process and the implementation of a given skill. For example, when mastering a skill that predominantly uses spatial and visual thinking, it is usually most efficient to use the visual channel as the dominant one and the others as complementary. Or, if the proprioceptive senses are mostly involved, it is recommended to use the kinesthetic channel of perception as the dominant one and the other channels as complementary. Spatial thinking is an activity that helps the athlete create mental images which they can adapt to solve practical and theoretical problems. Following this definition, we understand that it is this kind of thinking that is dominant when we are teaching and training different skills in bowling. A well-developed sense of spatial thinking will greatly enhance the bowler’s ability to learn and understand many physical and analytical skills related to bowling. In the bowling alley, where in addition to a good technical throw, the player is required to understand motion phase analysis of the ball along it’s path (skid, hook, and roll), changes in the oil pattern, types of pin action, and much more. In virtually all stages of the training process, spatial and visual thinking modalities are absolutely essential tools for a player’s success. Equally important is the development and the effective use of these kinds of learning modalities for the coach’s success in training their athletes. Spatial and visual thinking allows a player to simultaneously work on understanding technical elements of the physical game as well as forming motor imagery in the player’s mind (i.e. it can be used as the first stage of motor skill formation). Some elements of this technique are similar to the motor imagery practice, but it is simpler to use and does not require special training. We must simplify the process of mentally visualizing a technique to the point that the player can easily press “play” in their mind in order to see the technique played out. The creation of a mental image of a practiced movement is a prerequisite for its further improvement. The rate of a player’s improvement depends largely on the degree of detail and accuracy given to this mental imagery. Plus, fine motor skills will be used to develop such thinking skills as reaction time, attention, coordination, imagination, observation, and visual and motor memory. For using this training method, three things are needed: a video of a student’s shot, a video of an equivalent master’s shot (i.e. a bowler with similar physical and mental traits to the student), and a 12 inch tall mannequin, such as one used by art students and sold in stores like IKEA, Hobby Lobby, Michael’s, etc. Examples of the type of mannequins which are effective for this type of training are shown below. A small artist’s mannequin can be used to demonstrate physical poses during training. The coach and the student view the video of the student’s shot and discuss the technical elements which are to be worked on. The coach and the student view the video of the equivalent master shot and, once again, discuss the technical elements. Using the mannequin, create images of the necessary technical elements. Set the mannequin in the approach area of a lane or on the layout of a bowling lane for a more complete and correct understanding of the player’s position in the space. At the end of the process, ask the student to mentally reproduce all the movements in sequence. The mannequin can be used both on-lane and on top of a bowling lane overlay, such as the clipboard overlay shown. After a while, your students will be able to easily adjust the image of the necessary technical elements in full, and “play” it at will in their imagination. This method is especially effective for young players. Use of the mannequin during training sessions involving young bowlers is especially effective. Often, this method of training is not only useful, but it is also is a lot of fun. Give it a try in your own coaching sessions and see for yourself! “Skill” is the ability to carry out an action automatically without active conscious control. An indicator of skill competence is performance of an action without the need to consciously think about how the action will be performed. When a person has skill competence for a given task, it is no longer necessary to think about the execution of the skill via its separate partial sub-operations. Successful bowling, of course, requires competence in countless complex skills. One of the many jobs of the bowling coach is to develop and use the most effective methods of skill training on our students so that their learning processes can be accelerated as much as possible. In this article, I want to analyze the process of learning and the implementation of one specific bowling game skill. Namely, we will examine the line-of-sight construction skill of the bowler. Line-of-sight construction is a skill that allows the bowler to envision the launch trajectory of the bowling ball on the lane. We’ll start with some background and with a description of why this skill (as well as other similar skills) can be so challenging to teach. Finally, we will give an example of a new method of line-of-sight training that I’ve been using successfully with my own students to accelerate their development. Throughout my career as a bowling coach, I’ve had the opportunity to work with a wide variety of bowlers. This includes players at the novice level all the way up to the national team level. Additionally, I have a significant amount of experience coaching deaf bowlers. One of my students is a medalist in the Deaflympics and numerous of my other deaf students are European Bowling Championship winners. Recently, one of my female deaf students won a Gold medal at the 3rd World Deaf Bowling Championships in Bologna, Italy in August 2015. Working with bowlers who have different types of thinking skills has motivated me to seek out improved teaching methodologies for our sport. The task of building an efficient training process for deaf bowlers, for example, has been very non-trivial. This led me to deeply analyze the process of bowling skill learning from the perspectives of cognitive and educational psychology. This process uncovered psychological regularities of the bowling training process. Developing an understanding of these regularities has resulted in me adjusting my training methods for improved efficiency. This has led to significant accelerations in skill mastery for players of all types. Line-of-sight construction is one particular bowling skill that can be challenging to teach to both deaf bowlers and many non-deaf bowlers alike. Let’s start by taking a close look at this skill and the current methods of its teaching. All are features of both bowling and controlling an aircraft. Many complex activities in a wide variety of disciplines share these same characteristics. In bowling, line-of-sight construction is an important skill related to targeting that must be developed by bowlers of all levels. This skill is chosen as an illustration due to its importance in the overall structure of the bowling training process. Thus, the described skill of line-of-sight construction is one of the basic skills of our sport. The degree of its mastery defines the speed of a player successfully training the rest of the skills of bowling. It can be an indicator of his success as a whole on the lanes. In fact, the development of this skill is one of the first tasks facing a coach while training a new player in our sport. Entry-level bowlers: Often cannot imagine and describe in words the ball trajectory on the lane; are not visually concentrating on the point of sight during delivery preparation and execution; often use hitting the pins as an accuracy criterion; have no clear image of the line-of-sight. Mid-level bowlers: Can describe in words the ball trajectory on the lane; are concentrated on the point of sight (sometimes excessively) during delivery preparation and execution; use assessment of hitting the point of sight as an accuracy criterion; the line-of-sight image is in the forming stage. Advanced bowlers: Can describe the ball trajectory with precise detail in any area of the lane; are concentrated on the line-of-sight duringdelivery preparation and execution, with the ability to change the visual concentration to various points of sight along the line; use assessment of hitting the line-of-sight as an accuracy criterion detailed in various zones of the lane; the image of the line of sight is clearly formed in the visual imagination of the player and is used with no effort during delivery preparation and execution. As the results of this test show, there is significant correlation between overall bowler skill level and line-of-sight construction skill level. All existing targeting systems in bowling are built on the principle of line-of-sight construction on the lane. Differences in targeting systems are only in using different markers as the coordinate system for the line of throw construction (targets, pins, breakpoints, exit points, laydown points, starting position of the player, and so on). The final aim of all systems is a line construction on the lane surface and in the approach area. Operating with initial data in accordance with the theory of the throw line construction voiced by the coach, the player must use abstract logical, spatial, and visual imagination to construct the throw line on the lane and in the approach area. The player must then hold his concentration to perform a delivery, controlling his own movements and the subsequent movement of the ball relative to this imagined line. If it is necessary to change the ball trajectory, the player (using information provided by the coach) must recalculate the coordinates of the required markers and construct a new line. This is not an easy task. The main problem is in the constant interaction of abstract logical and visual representation types of thinking. Even when a player is given initial information in the form of visual images and tips from his coach, the transfer of these images to the real lane is always performed in the mind of the player. In such a case, it is impossible to avoid the process of personal interpretation. Solving this problem, we are increasingly becoming dependent on the features and level of a player’s abstract logical thinking and the abilities of his mental apparatus regarding the interpretation and transferring of the abstract logical concepts into symbols and images used by visual and representation thinking. If the player is talented in this respect, we get the correct image in his mind and we get it very rapidly. For other players, perhaps even those who are more gifted in physical and coordination abilities, this task may be very difficult. It may either take a long time to perform, or it may not even be solved at all. In my opinion, the difficulty of solving this problem for the player is not so much due to the level of the player’s ability. Instead, the difficulty is caused by the method of supplying the initial information and the proposed algorithms of solution. Too large of a role of abstract and logical thinking in the described processes can be destructive. We as bowling coaches are a lot like a teacher who tries to solve the problem of constructing and fixing in a pupil’s visual memory the image of a 90 degree angle. Doing this using only a verbal description is quite difficult. Even if the teacher is permitted to draw two randomly-arranged straight line segments and then explain in words how to form a 90 degree angle from them, it is still an incredibly difficult task. Alternatively, just draw two perpendicular lines, show the angle, and then add any verbal description for better understanding. The result is instant and the student immediately understands the concept of a 90 degree angle! I will now introduce a new method of line-of-sight construction training that I have used with great success with many of my students. The method involves using a device to create and consolidate in the spatial and visual imagination and in the memory of the player a bright image of the line-of-sight in the real playing environment during delivery preparation and execution. While training using this device, there is no need to describe the line image using objects of abstract logical thinking, and, as a consequence, there is no need for any interpretation by the player. This patent-pending device utilizes a luminous bar (3 to 5 meters high) installed above the lane in a vertical position. Depending on the particular training task, it can be installed in the targeting area, at the exit point, at the breakpoint, or as close as possible to pins. 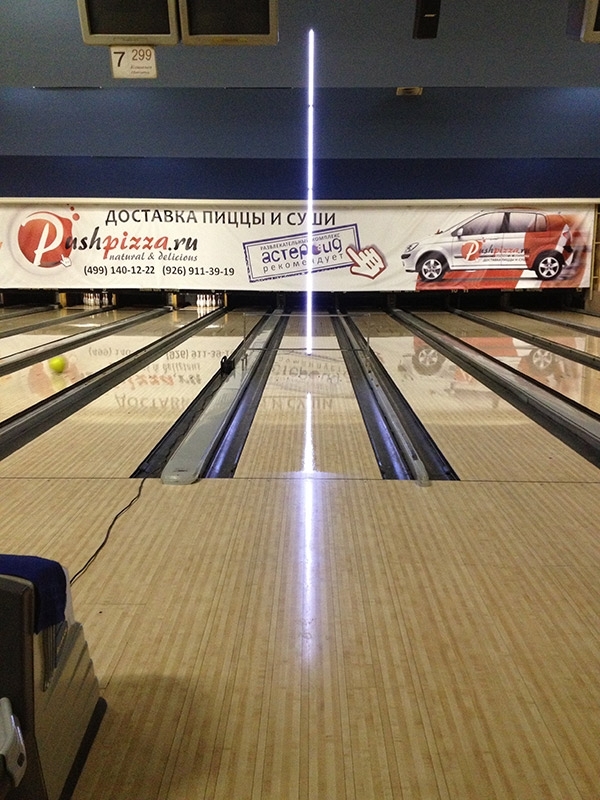 Reflection of this bar creates a bright and clearly visible image of the line-of-sight on the lane. This bright reflected line on the lane is used to train and consolidate the required skill of constructing the line-of-sight by the bowler. The property of the reflected line to change its position while the player moves left and right, as well as the possibility to change the initial position of the device, allows the bowler to almost intuitively understand the process of adjusting the line position on the lane. Since this training technique so directly demonstrates the concept of line-of-sight and its fundamental properties, it is even effective on players who haven’t yet developed advanced abstract logical thinking abilities, such as children. Here, the lighted bar is installed at the arrow zone for the purposes of 3-6-9 training. Hitting or nearly hitting the line visible by the player is only possible with correct technical throw execution. The possibility to assess visually the dynamics of the line-of-sight movement along the lane by the player during the delivery creates conditions for more effective correction and monitoring of the spatial and technical elements of the approach. This creates a very effective instant feedback system for the bowler. It becomes possible to see a diagram of oil application on the lane and its variations, because due to different oil amounts in different areas of the lane, the reflection coefficient of the light source varies. As a result, the thickness of the oil in different zones and the dynamics of its changes during play become visible to the bowler. The reflected light line creates the possibility of performing a visual assessment of lane topography. The curvature of the reflected line shows the deviation of the lane plane from the horizontal plane. Here are some additional videos of the lighted bar in use during training, both as viewed from the coach’s position behind the approach and as viewed through the eyes of the bowler. The practical use of this technique has shown that it has high efficiency. The image of the line-of-sight is quickly fixed in the visual memory of the player. After just a few training deliveries, it is not difficult for most players to use this image, even in the absence of the training device. Mastering the line-of-sight construction skill has become much faster. Testing has shown that the time duration of mastering this important skill is reduced significantly (sometimes by an order of magnitude) through the use of this device and this training method. Additionally, the skill is successfully mastered by players regardless of the development of their abstract logical and visual representation thinking. Often, after a month of training using this technique, entry-level players show a skill mastery level comparable to that of advanced players. This allows them to progress more quickly in their future training. Some of you might be wondering about the practicality of the above-described training method. It is true that it does require some special equipment. Also, like all things that happen beyond the foul line, use of such equipment requires agreement and cooperation with the bowling center owner. As of now, there is no commercially-available “off-the-shelf” luminous bar line-of-sight training system. However, it is a fairly simple design that can be constructed from components that are readily available. It can be installed on the lane in about five minutes and removed in three minutes. Also, I have built and used a version of this system that is fully portable. Development of a ready-made system that can be purchased by coaches is a possibility for the future. I hope you have enjoyed this introduction to some of the challenges in bowling skill training and that I have opened your eyes to the opportunities that exist in developing more efficient training methods for our sport. As previously mentioned, I have studied the theory of effective learning and skill development for bowling extensively. I have many other ideas in different areas of bowling skill development, such as timing training, swing direction training, ball reaction understanding, and more. I hope to share them with you in upcoming articles. Finally, I welcome your questions, comments, and suggestions, as they will be very beneficial in helping me decide on content for future contributions.